4/22/2019 6:03:13 AM - A quick one as I am furiously get ready for the upcoming tour to Japan. Hopefully if my programming goes well (I'm still fighting the computer as of this writing) we will be doing many of the songs from the new album "My Ever Changing Moods." If you're in Japan, please come and show support! Also, while I'm in Japan this time, I'll be taping for a show called "Groovin Jazz Night" for Asahi-TV BS which will air on August 4th and 11th at 10:00 p.m. We will be performing three of my tunes in a duet setting with guitarist Suzuki-san as well as two standards with the host of the program, pianist Shinji Akita and his trio. 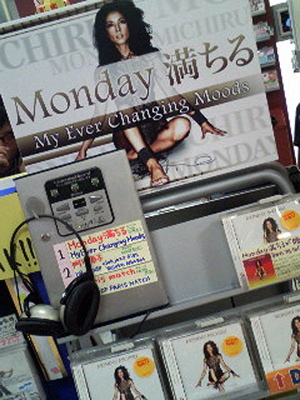 "My Ever Changing Moods" Release July 4!! -- It's out!! I have to say that this is a really special album in so many realms. Sasha (my husband) who rarely pays me compliments told me he thinks it's my best work...which must mean I have to work harder on my songwriting...ANYHOW! And people closest to me who have known my large body of works have all been giving a big thumbs up! One thing to note: While designing the cover for the album, I was swinging back and forth between a white background and red, and although we had agreed on the white, I still had a tender spot for the red. I put up both covers on my myspace page and people commented that they favored the white and red evenly. So we decided to print both on the cover and the inside of the cover so that you can flip it over to the side you like! There are displays in the Shibuya Tower Records and HMV which I've uploaded into the website gallery -- check it out! You can also check out the liner notes on my site. I also noticed it was displayed on iTunes-Japan on their home page, a nice plug. New Projects -- A couple projects just came to me out of the blue recently which I've already completed, to be released in the near future, that I'm very excited about. One is a compilation album that Toru Hashimoto (of Free Soul and Cafe Apre Midi fame) is putting together of music by Antonio Carlos Jobim covered by various Japanese artists, which I am very honored to partake in. I chose "No More Blues" and Sasha did the arrangement. We were given a rare recording which Hashimoto-san had in his collection as the main image of how he wanted us to do our version, and using that as a mold we put in our 2 cents and came up with something that I think is really warm and true to this classic and beautiful song. What fun! It'll be released in September 19, 2007. The other project is a remix I did for a young Japanese singer, Kim Bianca, who is making her debut in the next couple of months. The original is a perky garage-tempo pop track, so I decided to toughen it up a little via afro-beat/house style and completely revamped the chords. Dave Darlington of course hooked it up in the mix with his vast experience in the NY house style and I think it came out darn good! Others -- By now I'm sure many of you in Japan have seen the advertisements in the magazines and newspapers for the special event that Mastercard is putting together of a private concert by my mother and myself in an intimate duet setting. This will be taking place on November 1 at a yet undisclosed venue in Tokyo. Possible dates (not with my mother) may follow around that period so keep your ear to the ground! Recently I was contacted by a company that makes those nifty in-store compilations that you hear whenever you go shopping in various shops through the U.S. and have licensed material from "Routes" as well as "Alternate Routes" for their use. Apparently Old Navy was interested in my stuff, so who knows, maybe the next time you go shopping at Old Navy you'll get a little MMM -- Monday Michiru Music! And that's about it from the Big Apple as I prepare to go to the Rising Sun! I hope to see you guys there! And to all, enjoy your summer! !